Metal Reflectors: These reflectors are available in different sizes. 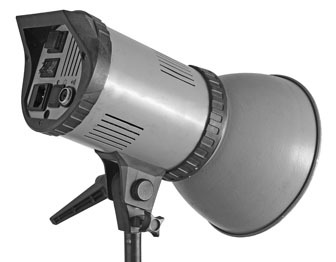 They can be mounted on the body of the flash light, and will reflect back all the light in front direction. Most of these reflectors are parabolic in shape. These reflectors are used in most of the cases. It is also used along with umbrellas. Main function is to increase the intensity of light with its reflective surface. 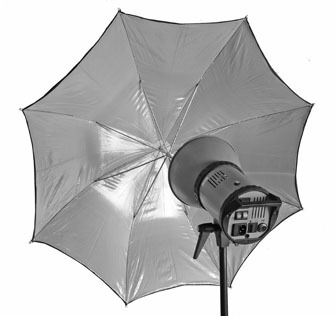 Read more about how to select a good metal reflector for your studio flash light. Snoot: It is a conical hollow tube, which will throw a controlled beam of light without any spread. A spot of bright light is created, which is round or oval in shape, depending on the angle of light. There is no gradual fall in illumination on the edges. Snoot is mainly used for creating a dramatic bright spot. Honey comb: Honey comb creates a spot light, which is gradually dimming. It is a grid having hexagonal holes. When it is introduced in front of a flash light, it will allow light to pass through. However, the intensity of light will fall on the edges of the grid. Depending on the length of the grid, the angular fall of light will change. The effect created by honey comb is subtle compared to a snoot, yet, it creates a bright spot. Spot fixture: This light attachments create much controlled spot light. 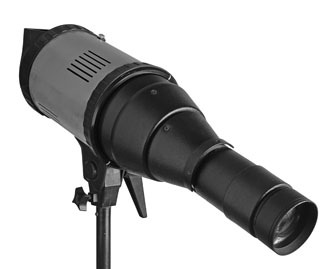 Lenses are provided in the barrel to focus either a sharp circular spot or hazy spot. There is a provision to insert "cookies" in the path of light. Cookies are metal plates having different shapes of opening. It can be a window shape or a vanishing blind shape. A spectacular spot formation is created depending on the cookie we use. Umbrella: As the name suggests, these are umbrellas, but without handles. Flash light has a provision to take the central pipe of the umbrella in it to hold it. They can be made up of single white cloth, or with an outer cover of black cloth and inner side either white, silver or golden cloth. White umbrella is used to throw light through it. Black umbrellas are used to reflect light. White umbrella will give soft reflected light, where as silver will give more. Golden umbrellas are used in fashion photography, where we may need to enhance the skin tone. Umbrellas are available in different sizes. Large one like 6' in diameters will give softer light and smaller one will give medium soft light. Umbrellas can be used when shooting matt finish or semi-matt finish subjects. As skin falls into semi-matt, umbrellas can be used but if the surface of the subject is shiny, then umbrella will be visible as reflective surface will reflect it in high lights. Soft box: These are good light attachments to modify a flash light as soft and even light source. A soft box is square, rectangle or octagonal in shape. Square and rectangular soft boxes are used in product photography, when the surface is shiny and light source is visible in the product as reflection. Octagonal soft box can be used for fashion photography. 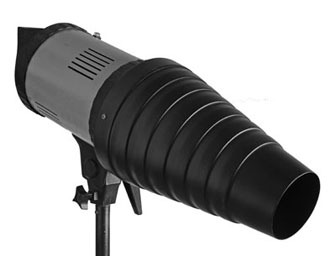 A well designed soft box is in a parabolic shape. Very powerful flash is placed to throw light away from the subject. This light is reflected back and passed through two layers of frosted acetate or any other diffusion. This will give even and soft light. However, other good designs are available with less powerful flash pointed directly to the subject. 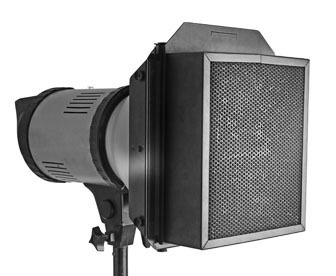 Any good designed soft box should throw same amount of light from any part of its surface.